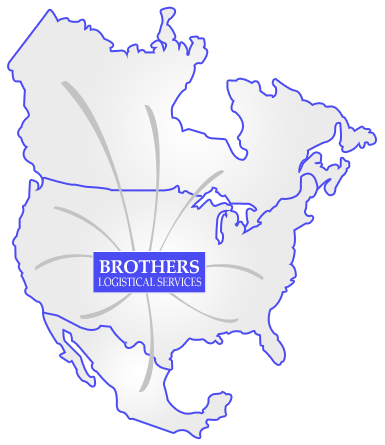 Brokerage Services - Brothers Express Inc.
Brothers Logistical Services provides fast, courteous and dependable transportation services with reliable partner carriers of general commodities throughout the Continental U.S., Canada, and Mexico. Our flexibility enables us to offer competitive rates to transport a wide range of product. Our services include dry vans, flat beds, and refrigerated units. Our Expedited Service provides you with a carrier capable of handling all your expedited needs, ranging from minimum shipments through truckloads, at a very competitive rate. With Contract Carrier Authority and Property Brokerage License, we have the ability to provide for all of your transportation needs. Our insurance coverage includes cargo coverage at one hundred thousand dollars as well as liability at one million dollars. Click on the link below to contact one of our experienced, professional staff member to discuss you specific transportation needs!